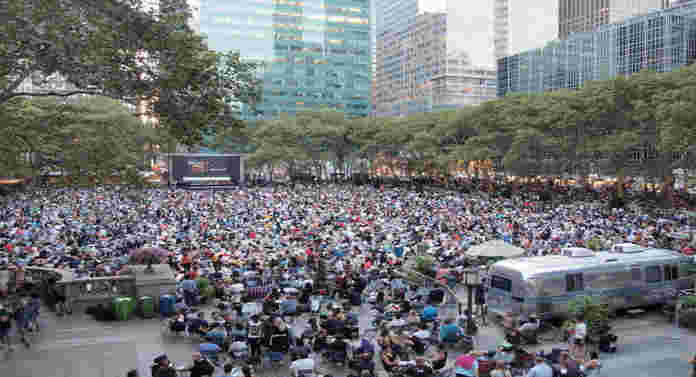 Get to the lawns of Bryant Park in Midtown Manhattan to watch Free movies with popcorn on Mondays from June 18, 2018 to August 20, 2018. Film screening begins at sunset between 5PM-11PM. No chairs, tables, dogs, or plastic ground coverings (including sheets, tarps, bags, or pads) are permitted on the lawn. Free bike parking is available in the park at the Pétanque Courts (6th Ave and 41st St). Time: 5PM-11PM Movies at Sunset on Mondays from June 18 – August 20, 2018.